There's more than one way to be a Champion at Pikes Peak. 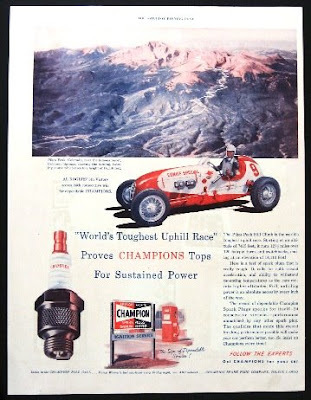 I love these vintage Champion spark plug adds. 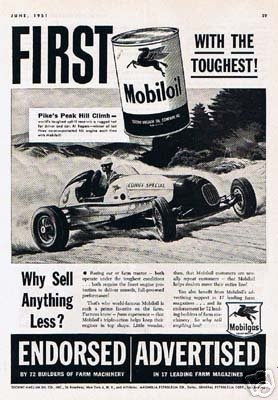 Just about any automotive brand name you can think of used to try and capitalize on major races back in the day. There were manufactuoires of tires, filters, oil, spark plugs, gaskets, brakes and more. As a matter of fact it was a good investment for advertising dollars back then. Many times I had customers tell me they wanted to use "Brand X" because they read that is what the big name racers were using or had seen someone win a race on TV over the weekend and saw the brand on a decal on their car. Fiesta to make its U.S. motorsport debut as the Olsbergs Motor Sport Evolution race team brings two Fiesta Rallycross cars for competition at Pike’s Peak International Hill Climb in July. · High-profile event for Fiesta helps brand grow awareness among U.S. racing and performance enthusiasts. Big Shout Out To Blanco Basura Racing! 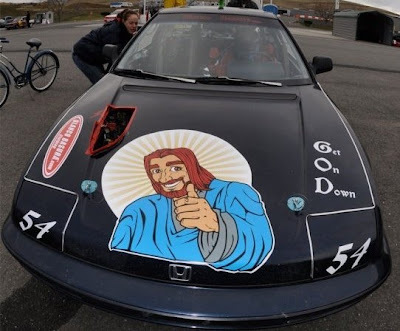 Team California's Best would like to congratulate Colin Herricks Team for an outstanding showing in the 24 Hours of Lemons at Reno. Many of you will remember Colin and his father ran with us during the 2007 La Carerra Panamericana in a late model Mini and two finer gentleman racers you will never meet. After a good start on Saturday his team Blanco Basura Racing, went on to finish an awesome 1st in class and 2nd overall. On a more important note Team California's Best would like to congratulate Colin and his lovely wife on their new addition to their family. I would post a photo of their new baby girl too except for the fact she hasnt arrived just yet but real soon. It looks like a great year for some great friends. CLICK HERE for a look at some Pikes Peak Hill Climb history from 1934. Having raced cars for so long I have had my fair share of crashes, flips and roll overs but now that I am headed to Pikes Peak I believe is should be clear why this one stands out in my mind. It was a freak accident in that when I swerved off the gravel road and flew thru the air the first thing to hit was the front end of the car and at the same time as it hit some stumps it began to flip. When it flipped and went over on it's side I hung on to the steering wheel which caused my body to swing out across the front bench seat. At the same time the rear seat had flown forward and when the car crashed on it's roof it sandwiched me between the two very padded car seats of my 1958 Ford which is where I was trapped. I continued to roll end over end a total of 375 yards in what was the only section of road where the trees had been logged or otherwise I would only have gone a few yards off the road. Another amazing fact was that two loggers had come around a corner just in the nick of time to see my taillights going off the corner or else nobody would have even known I was down there. When the car stopped it was on it's side and the two loggers were yelling, "Are you alive? Can you hear us?" I was 17 and I kept yelling back, "How does my car look? Is it OK? Will my dad be able to tell I was in a wreck? Oh God, what will he say?" 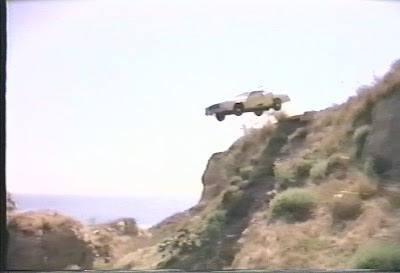 When they were finally able to pry the roof open to get me out I saw the car sitting only inches from another cliff and on it's side. This time had it rolled one more time I would have dropped right into the deep side of the Rogue River and drowned. You should have seen what was left of that car. All four doors were ripped off but ironically the drivers side mirror was still attached to the fender. When it was all said and done I walked away without a single scratch or bruise on me. Obviously someone was watching over me that day. But the funny thing is, had it not been for that crash I would never have been forced to swap the engine, transmission and rear-end into another car that I traded my electric organ my parents had just bought me. Who knows had I not learned how to fix cars I may have been playing country western music at some bar in Colorado. 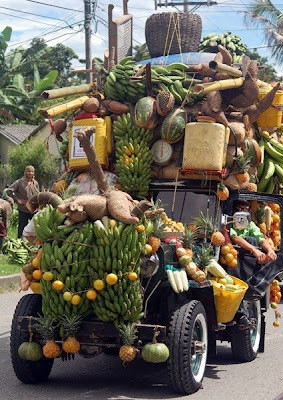 Maybe I'm Taking The Wrong Car... Not! Very impressive when you consider these guys did it in 22 minutes way back in 1920 and today the record is about 10 minutes. 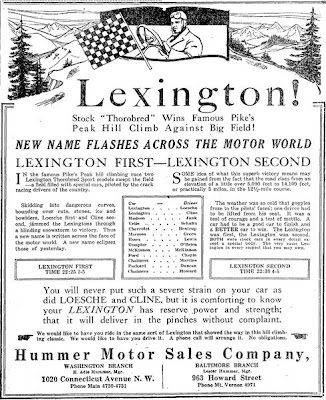 In 1920, Lexingtons placed 1st and 2nd on the 1920 Pike's Peak hill climb. The drivers were Otto Loesche and Albert M Cline. Otto Loesche was also winner of Indy 500 fame. He repeated his victory in PPIHC in 1924. From advertisement in Washington Post, Sep 6, 1920. 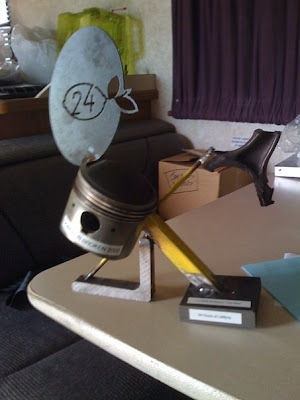 Stock "Thorobred" Wins Famous Pike's Peak Hill Climb Against Big Field! In the famous Pike's Peak hill climbing race two Lexington Thorobred Sport models swept the field - a field filled with special cars, piloted by the crack racing drivers of the country. Some idea of what this superb victory means may be gained from the fact that the road rises from a elevation of over 5,000 feet to 14,109 feet, or practically 3 miles in the 12.5 mile course. Skidding into dangerous curves, bounding over ruts, stones, ice and bowlders, Loesche first and Cline second, jammed the Lexingtons through the blinding snowstorm to victory. The weather was so cold that goggles froze to the pilots' faces; one driver had to be lifted from his seat. 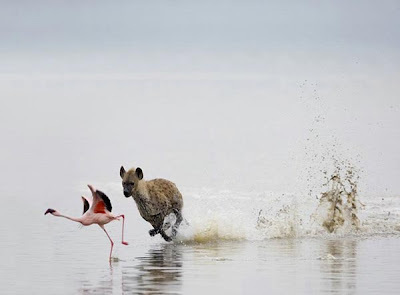 It was a test of courage and a test of mettle. .... Both cars were stock cars in every detail except for a special body. 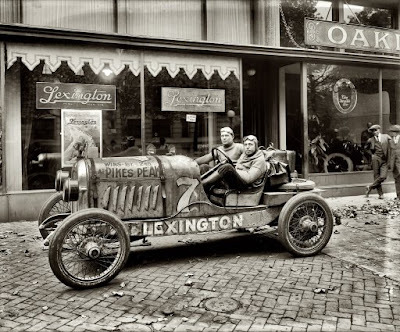 You will never put such a severe strain on your car as did LOESCHE and CLINE but it is comforting to know your LEXINGTON has reserve power and strength; that it will deliver in pinches without complaint. Hummer Motor Sales Compay, Washington Branch, E. Adie Hummer, mgr., 1020 Connecticut Avenue, N.W. Déjà vu is the experience of feeling sure that one has witnessed or experienced a new situation previously (an individual feels as though an event has already happened or has happened in the near past), although the exact circumstances of the previous encounter are uncertain. Check out the photo of my GT350R I found taken by professional photographer Clement Marin. 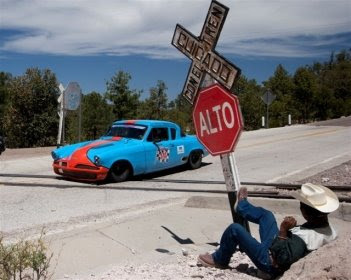 It was taken in Mexico while running the 2007 La Carrera Panamericana. 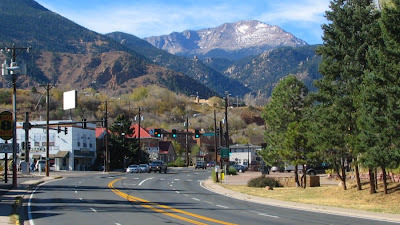 Now take a look at this recent photo taken in beautiful downtown Manitou Springs at the base of Pikes Peak which is where I will be staying. I don't know about you but they are eerily similar to me. I sure regret not having been able to compete in last years Pikes Peak International Hill Climb but fortunately one thing I will never regret is the great friends I have been blessed with as a result of La Carrera Panamericana and already some other competitors from the PPIHC that have been so helpful even before we meet and there are many. Personally, besides all the friends that form a racing community and a bond of sorts (and dont forget those awesome race fans) another very important reason to take part in PPIHC is two fold. One is simply the excitement and significance of being part of the historical value os this race. Secondly is simply because I'm a racer that loves an exciting and challenging race and if you can think of race more exciting than this one I sure would like to hear about it. One thing I really enjoy about this specific race is that all the vintage cars run against each other no matter if they have a 6 cylinder, a big V-8 or even a bigger V-8. At the end of the day the last thing I want to hear is "I would have won but John Smith had a bigger motor than me." The truth is, in the good ole days of the PPIHC drivers "run what they brung" with every one of them doing every thing in their power (and budget) to build what they thought would run the best. It's very important to remember that the car isn't worth a plug nickle if it isn't driven by a great driver. Pikes Peak by its self can be very intimidating and unforgiving and with so little margin for error, no guard rails and the Devil himself trying to take you back down the hill the wrong way, it really doesn't matter what size engine you have. I cant wait to test and then race the mountain because this race is not about beating any other driver and God knows it sure as hell isn't about beating the mountain... It's all about the experience, the friendship, the camaraderie and the love of racing. God knows building a race car that will stand up to the challenge and do well in La Carrera Panamericana is without a doubt a huge undertaking. Just one of the many challenges of such a build is dealing with the high altitudes found along the route which range from sea level and go up to 10,000 feet. It's a well know fact that the high altitude is responsible for a HUGE horsepower loss and there is only so much you can do. When does a vehicle need lots of torque? When climbing up steep hills,” says Mike Shelby, Combustion and Emissions technical specialist for Ford Advanced Powertrain. “Unfortunately, the performance of most car engines decreases as a vehicle climbs to higher altitude. Now let's put things into perspective when comparing La Carrera Panamericana versus the Pikes Peak International Hill Climb engine preparation consider this... Pikes Peak International Hill Climb "begins" at 9.390 feet then rises to 14,110 feet in only 12.42 miles!!! This week I have removed the transmission and scatter shield to inspect the clutch and scatter shield alignment and I will be replacing some minor parts including a pilot bushing and throwout bearing. I love getting ready for an event like this. It's early but as anyone who races knows time can really run out fast when preparing for a race so I wont take anything for granted. Tentatively, Gerie Bledsoe and I will be leaving the S.F. bay area on July 10th for the 2 day drive to Manitou Springs at the foot of Pikes Peak. If you act soon, if someone who would like to share the ride out and back drop me a note. Known As America's Mountain... Man That's One Crooked Road! Remember the tale about the man who removed a thorn from the lion's paw and by chance many years later the lion remembered the man and saved his life... Well since I am so excited and want so badly to share my excitement, bear with me here while I make my point. Just like any other race I have begun doing my homework and research for the entire array of items I feel necessary so that I will be as prepared for competing in the Pikes Peak International Hill Climb as I can be. That said, Lucky was removed from the trailer on Monday and the preparation began. For me it's an entire ritual, see what's needed, what problems if any did the car have the last time I raced it, what will it need for this event and are there any special needs for this specific event. It was during my research that I began wondering about tires and as it turned out there is a hell of a lot more questions than anyone could ever expect. For the most part on any road course you either need rains, or slicks and you're covered. But when running Pikes Peak the sun may be shining and 90 degrees when you start but by the time you get to the top it could raining or even snowing! Don't laugh, it happens all the time and as of right now there is still snow up there. And if that isn't enough some of the road is asphalt, some gravel and some dirt. If it rains God only knows what to expect. As exciting as the PPIHC is, can you just imagine doing it when it's wet, slick and muddy. Yeah Baby! Part of my research included speaking with drivers who have competed in PPIHC including numerous veterans and last years winner Doug Mockett. Since vintage race cars have not run PPIHC in many years and since the road conditions have changed considerably since vintage cars last ran not much is known with regard to what sort of tire best suits all of the conditions. Then comes the strategy of what works best for each specific driver depending on their driving habits/ability on asphalt or dirt. The bottom line is it's all very complex and choosing the wrong tire can make a huge difference in the outcome of the event. As the day wore on I found I had more questions than I did at the beginning of the day. The more people I called the more confused I became but finally I ended up talking to someone who really knew what he was talking about. And who would know more about what tires to use on PPIHC than someone who not owns a tire business in Colorado Springs but is also the PPIHC Chairman or the board Bob Gillis!!! Not only does Bob know tires but he has taken care of the tire needs for many of the great drivers who previously run Pikes Peak like Rod Millen, Unsers, Andretti and many more. Thanks to Bob for such a nice welcome and what was a rather lengthy phone call plus now I was beginning to get somewhere as he filled me in with his many years of expertise. Under the believe that I had the tire issues sorted out it was time to call and make arrangements to get Lucky an appointment with Roger Kraus Racing Ent. Anyone in California who knows anything about racing alignment knows that without a doubt the absolute most knowledgeable racing alignment experts to be found is Roger Kraus Racing. Two years ago when we took Lucky to Race in La Carrera Panamericana Roger Kraus Racing set up the ride height, springs and alignment which turned out to be one of the single most important aspects of a two year build and one that helped place us on the podium. Take it from me... you can throw all the money in the world at a race car but unless it gets the race car alignment needed for a specific track or race your money just as well should go into the trash can. Since Roger Kraus Racing had always been my go-to racing alignment shop I had no doubt they would know exactly what to do to prepare Lucky for Pikes Peak, what I didn't realize was the extent of knowledge that owner Roger Kraus possessed when it came to tires. Just like the phone call to Bob Gillis, once again I found myself glued to the phone listening to a master teaching me the grasshopper what makes the universe the place it is or better yet, what my best tire choice for Pikes Peak was and why. Alas, why the lion story pertains to this post... Remember that the lion never forgot the what the man did for him. In this case Roger Kraus never forgot what I wrote about them two years ago when I wrote about what an awesome business they operate and how great they are. Today Roger told me, I have never forgotten all the kind things that you had written about our business. Furthermore, I am always trying to learn more so that I can better serve my customers. That said, I would be more than happy to sponsor all of Team California's Best tire needs to run this years Pikes Peak International Hill Climb." Needless to say I had to pick myself up off the floor and after talking more with Roger he went on to tell me Lucky was not going to be running Pikes Peak with just any ordinary set of shoes but in fact some of the most amazing racing tires any car could ever ask for. (More on them later) For now just let me say I am walking on air tonight and there just are not enough ways to tell all of you how happy Roger Kraus Racing has made me today. 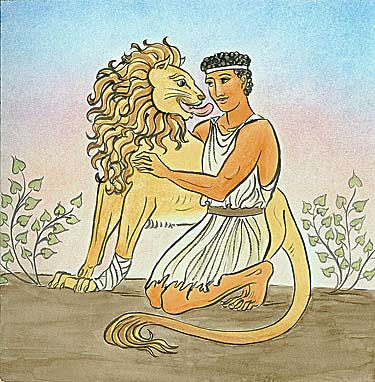 Thank God the Lion didn't forget. Thanks Roger and Gang! During my years of racing and owning teams I have always been amazed at the vairous driving styles and the drivers performing them. Even more interesting is while racing on the exact same track under the exact same conditions how many various lines, braking points, apex each one will take and even more interesting is they will typically be within hundredths of a second of each other. Having studied countless hours of in-car footage of some of drivers who have driven for me I find it amazing how some will be steering, shifting, braking and driving like a mad man while another looks as if he is going for a Sunday drive in the country-side and both of them truing the exact same lap time. Today I found these two in-car videos of two different drivers driving two different GT350s in the historic Noosa Hill Climb better known as "The Hill which is the the premier hill climb event in Australia. If you watch these two videos you will clearly see exactly what I am talking about. As a matter of fact, the second video showing a mad max driver who is sliding thru the corners, hands going crazy on the wheel, wide open throttle and so on actually turns a slower time than the first driver. The first video shows a smooth driver more in control. Of course he's not nearly as fun to watch but he would get my vote for a driver if I was looking for one. Or should I say the clouds which is where Lucky and I are heading; more specifically I have made up my mind to run in this years 87th running of the fabled Pikes Peak International Hill Climb. 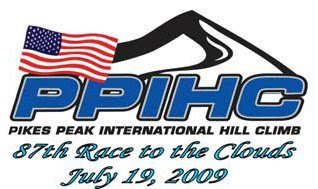 Since I grew up over the years visiting family near Pikes peak and having spent a lot of time at the Olympic Training Center in Colorado Springs which sits at the base of Pikes Peak I have gazed at it numerous times dreaming of racing up that mountain. Anyone that knows anything about racing knows that PPIHC is America’s second-oldest motor sports race behind the Indianapolis 500 and was first held on August 10, 11, and 12, 1916 and many of us grew up watching it on TV and has been won by such famous drivers as Mario Andretti, Al Unser and Bobby Unser was won this year by former NASCAR driver, Wally Dallenbach, son of the legendary Indy 500 racer. Through the years not much has changed as the road has been widened and some sections have been paved. Other than that, the course and race format have not changed significantly from the original as drivers and cars came from all over the world to compete in one of the most grueling courses known to the world of racing. Consisting of 12.42 miles of dirt and some paved road, the route feet above sea level) to the peak’s 14,110 foot summit. Last year saw the return of vintage race cars greatly due to the popularity and success of cars which had competed in La Carrera Panamericana and quickly became a crowd favorite. 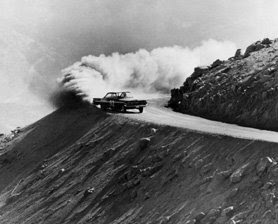 Anyone who has raced cars at one time or another has dreamt of making the assault on Pikes Peak myself included. Now that dream is to become a reality and I cant begin to tell you how exciting the thought of this all is. 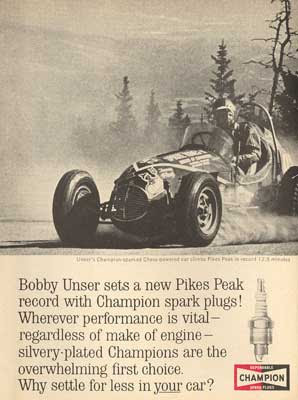 Speaking of Shelby and Pikes Peak here is some ironic trivia for you... Right after Carroll Shelby had won Lemans the first place he went was to Pikes peak because he was the Goodyear race tire distributor. It was at that very event that Carroll ran into Ford's, Dave Evans, and he said "Mr. Evans, I understand you have a new small-block V-8, and I have an idea how to use that engine.'" Evans invited Shelby to Detroit, though Shelby wanted to make sure he could get his arms around the AC Ace chassis and body before he met with Ford. "I flew to Europe, and sat down the Hurlocks (owners of AC) and told them what I had in mind, and they said yes, they would be interested." Shelby then went to Detroit, where he met with Evans, Don Frey (assistant general manager of the Ford Division), and already prominent Ford exec Lee Iacocca. 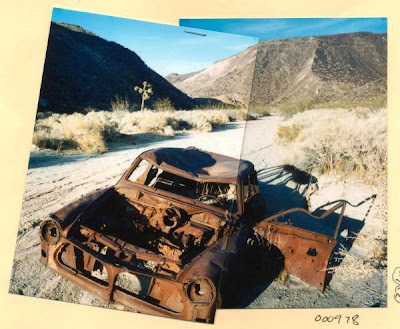 "I told him that I had a chassis, and that, if I could get these Ford engines, I thought I could build a car that would blow off the Corvette. I needed to borrow $25,000 to build two cars, plus engines. Iacocca agreed." 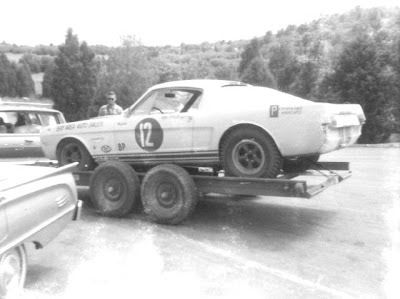 Needless to say the rest is history and here I am 45 years later preparing to take a car up Pikes peak that came to be a reality due to Carroll Shelby meeting a man on the mountain there. Makes me wonder who I might meet while I'm there. One such car that made the journey up the mountain was also a 65 Shelby GT350R just like Lucky. As a matter of fact it's roots are from right here in the bay area which is where Lucky hails from. It was sponsored by Bay Area Auto Sales in Fremont, California and won the Cal Club SCCA Regional Championship in B/Production in 1969. Recently it was sold at auction for a price of $990,000. Here it sits after having run Pikes Peak in 1966. This coming week will find Lucky backing out of the trailer and into the shop for preparation to run Pikes Peak International Hill climb. (Boy does that have a nice sound to it.) Like any other race, I will begin by making sure everything mechanical is up to the challenge then I will begin researching tires, air fuel ratios, gears and so on. Hotel reservations are already made, map in hand and the race is less than 2 months away. In the meantime enjoy a couple PPIHC videos. 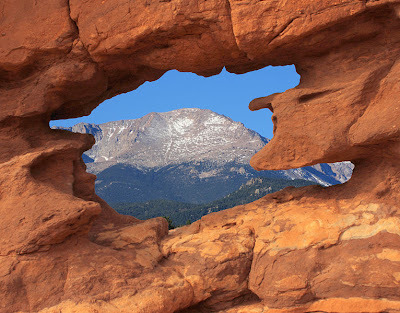 **PIKES PEAK – LAST CHANCE! **PIKE’S PEAK – LAST CHANCE! 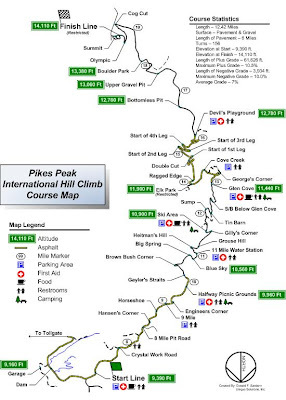 Is the Pike’s Peak International Hill Climb on your bucket list? Do not wait. Join us this year. Only $800. That’s cheap--about half of the regular (pro) entry fee. Just about any Carrera car or vintage racecar with a full cage is eligible. Vintage entries are filling up and may be gone soon. Doug Mockett and Angelic Fuentes will be back to defend their championship on July 19. We will practice on the mountain three mornings, before the main event. Contact Tony Martins cycleworksusa@msn.com if you are interested. 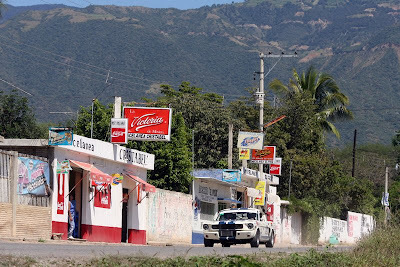 Entries in La Carrera Panamericana XXII seem to be holding up against the swine flu and other problems, like the friction along the border between the U.S. and Mexico. The flu scare seems to be fading fast, and should be only a faint memory by October. We should have around 40 entries from Canada and the U.S. this year. The problems along the border continue to be bothersome, however, but the presence of several thousand Mexican soldiers and federal police in the border towns has reduced the violence dramatically. Last month, participants in the Chihuahua Express saw no signs of violence along the border or in the city of Chihuahua. Life seemed pretty normal. The U.S. has also agreed to do more to stop the flow of guns and drug money into Mexico. The effort to legalize marijuana, which is picking up steam in California, would put a big dent in the cartels’ income and produce big bucks for the state treasury, says one state legislator. A diplomatic flap between the U.S. and Mexico caused when the U.S. government stopped Mexican long-haul trucks from entering the country did cause a problem at the border for one of our trucks hauling cars to Chihuahua. Again, this problem should be resolved by October. On June 1, the entry fee for the Pan Am jumps another $500 USD to $6500. Please send in your checks by May 31. If you sent in a deposit of $500, the balance due before June 1 is $5,500. Make checks payable to “La Carrera USA” and mail to address under contact info below. Rooms in Huatulco may be booked through the Carrera Office in Mexico City for $150 per night. Premium hotels cost $300 per night (limited availability). If you want an all-inclusive package deal, add $100 to the price of the regular hotel per night and $150 to the premium hotel’s cost. The package deal includes: three meals daily, box lunches, five different restaurants, juice and soft drinks, alcoholic drinks, minibar, snacks, no-power water sports, plus 24 room service to your room, poolside, and the beach. But the best part of the package is clearly the two “alfresco Jacuzzi pools.” Think any Corona girls will be there? Email Monica Grossmann at monica.grossmann@yahoo.com.mx to make your reservations. In addition to starting in Huatulco, which was not on the original Carrera route, the event will visit Guadalajara this year, the first time since 1999. Guadalajara, the second largest city in the country, has a population of several million. Best to update your Garmin GPS software. It’s big city. Try Mexico Maps for the latest Garmin software. Email Mark Walker mwalker@mexicomaps.com for info. Guadalajara takes the place of Aguascalientes, which the race has visited every year since 1999, at least. Apparently the Chamber of Commerce in Guadalajara came up with more incentives this year than Aguascalientes. Guadalajara was not on the route of the original Carrera either, but it is an important city. Unfortunately, the detour will add several extra hours of transit time to the schedule. 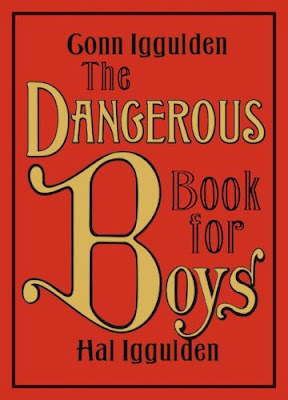 Yes, I have taken the plunge. CARRERA NEWS will be posted as a blog on my web site www.panamrace.com. To read the blog, go to the web site and click on “News,” at the top of the home page. In addition to CARRERA NEWS, I will post other tidbits from time to time. CARRERA NEWS will continue to be sent as an email every month to the 1400+ individuals on my email lists. Most of you with smart phones can receive it with no problem. The photos may not come through, but you can check them later on the web site. 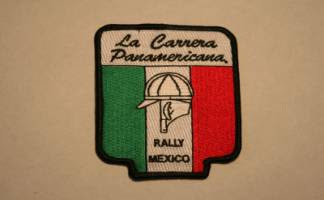 Need a Carrera patch for your hat or jacket? 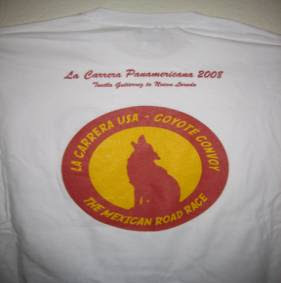 How about a Coyote Convoy shirt? I have both for sale for $10.00. Add $3.00 S&H for a shirt. All net proceeds go to the Mexican nurse, Lupita Hernandez who lost both legs at the hip in a Carrera accident in 2003. We send her a small check every six weeks. You may advertise here for drivers, co-drivers, and service crew at no charge. You may ALSO advertise your car, truck, or services for sale/rent here and on the web site www.panamrace.com for $30; $45 with photo. Send the info and photo to Laura Cox at lauracox@austin.rr.com with a check to be posted on the web site. Most of the cars posted on the web site are sold. I also broker cars for a very modest fee. ’64 Chevy Nova -- $5900/BO. V8 post coupe, four-speed Muncie, GM front disc brakes, headers, newer exhaust, and seats. Rust free, with new steel floors on sub-frame connectors. Interior and exterior stripped, ready for race preparation. Want it prepared? Pick your color, competition level, and engine power—from 300 to 400+ HP. Cost? Around $18,000-$28,000+ depending on the level of preparation. Guaranteed buy-back program. Ten years of experience building these lightweight cars. Novas were the Historic “C” Champs in 2001 and 2002. Guaranteed entry in 2009or 2010. At 2800 pounds, it can run a four-barrel Holley. Extra safe roll cage and subfloor protection.. Shipping can be arranged, along with support during the race, and even rally driving instruction. We had ten years’ experience building these cars. Contact Gerie Bledsoe at gbledso@aol.com. 650-726-9890. Lucky Taco -- needs another co-driver/partner for 2009. It’s a ’54 Oldsmobile that runs in Original Pan Am. The three experienced partners need a fourth. Bridge anyone? Contact Clyde Morter if interested at Lakehart2@aol.com. Enrique Cortes will provide mechanical service while you are in Mexico. Check his video on MyTube. Enrique lived in the US several years and has two support trucks. He and his crew will wrench and weld all night for you. New York to Miami, three days in August 2009, to benefit the Women’s and Children’s Hospital of Buffalo. Call Dan at 716.480.0703 or visit www.rallyamerica-usa.com. Photographer Sam Gezari is compiling two books on last year’s Pan Am that will be published next month. To obtain more info on the books, call 213.880.4001 or go to www.carrerapanamericana2008.com. Like all forms of motor sports, the Pan Am is extremely dangerous. Obviously, it is less dangerous at moderate speeds. It can also lead to a lifetime of addiction to road racing in Mexico. Feel free to send CARRERA NEWS to your friends and racing buddies. Encourage them to sign up. This newsletter will be posted on the web site www.panamrace.com as a blog. I feel truly blessed and speaking of father and son racing families today was another awesome day in that I got to visit with one of the all time great NASCAR drivers, Buddy Baker who is the son of two time winner of the NASCAR Championship and a Hall of Fame member Buck Baker. During his career, Baker won nineteen races including the 1980 Daytona 500, NASCAR's most prestigious race. 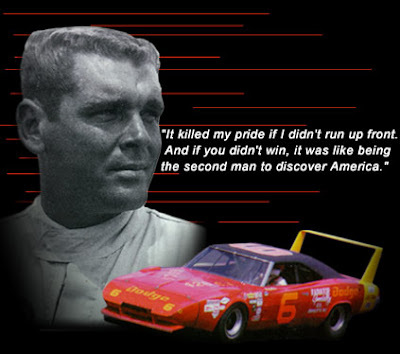 His victory remains the fastest Daytona 500 ever run, with an average speed of 177.602 mph. Buddy is one of eight drivers to have won a Career Grand Slam by winning the sport's four majors... the Daytona 500, Aaron's 499, Coca-Cola 600, and the Southern 500. Richard Petty, David Pearson, Bobby Allison, Darrell Waltrip, Dale Earnhardt, Jeff Gordon, and Jimmie Johnson are the other seven to have accomplished the feat. He is the only one of the eight to not win the championship. Buddy and I had an incredible visit but you should have heard how excited Buddy got when I told him Hershel McGriff was going to race again at the age of 85. I didn't think Buddy was ever going to stop talking about Hershel and his many amazing accomplishments and he said he had never met a man with bigger..... (Well, let's just say, "tires") than Hershel. But what really surprised me was how much Buddy knew about Hershel. 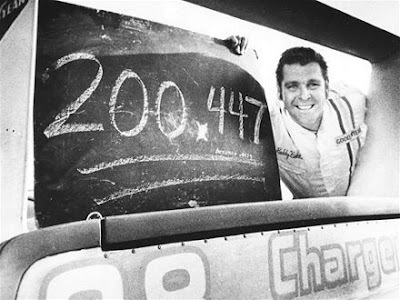 I was really surprised when Buddy told me Hershel had driven for Buddy's dad, Buck Baker. He has so many gvreat and colorful stories about Hershel but one of them was about the time Buck went north for the weekend to race and he sent Hershel to the south. When the weekend was over the two of them had won five major races in a single weekend, a NASCAR record that still stands to this day. Buddy told me that Hershel was well known to be the sort of driver that never burnt the candle at both ends; meaning, while other drivers were up celebrating in each town they came to, Hershel did what ever it took to be ready to beat anyone he came up against which he did most of the time. What a privilege it was to spend time with one of the most recognizable and colorful NASCAR drivers of all time. Funny thing was, when I talked to Hershel this afternoon he told me he remembered Buddy being only 5 years old when he first met him. Why Did The Bear Go Over The Mountain? Who cares? Besides, it's the getting there that really matters. It's time again to get ready for Pikes Peak and the La Carrera Panamericana cars were so sucessful at being a huge crowd pleasure that we have been invited back again. Tell me this isnt a bitchin example of hangin her out on the edge. Colorado Springs, January 12----America’s long love affair with its automobiles continues this summer in Colorado Springs in a big way. That’s because Vintage Cars will be back again for the 87th running of the Pikes Peak International Hill Climb on July 19. Nope, I kid you not. My amazing friend and NASCAR legend, Hershel McGriff, just called me first to make the announcement that he will be running at Infineon International Raceway on the weekend of June 19 -June 21 during the Toyota/Save Mart 350 and is entered in the NASCAR Camping World Series West. Besides winning the first ever world famous La Carrera Panamericana which was held almost 50 years ago Hershel still holds the distinction of being the oldest driver to have raced at the age of 65 but even more amazing when you consider that Hershel is now 81 years young and about to compete not only at Infineon but in fact the entire NASCAR Camping World Series West. Hershel won a race in the initial year of the series with NASCAR, when it was known as the Pacific Coast Late Model series in 1954. With 35 victories, he is Winston West's winningest active competitor. He began his stock car career in September 1945 at Portland (Ore.) Speedway. He won the 1950 Mexican Road Race. He competed in the first Southern 500 at Darlington International Raceway. He accumulated the most wins (14) at the old Riverside (Calif.) International Raceway. He has competed in a stock car at LeMans, France, in Australia and in Japan. He won the 1986 NASCAR Winston West Series Championship. He tops the list of pole awards in Winston West Series poles (35).